One size, depends on gauge/ yarns used. 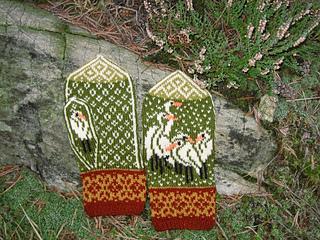 The mittens are 72 st. wide in the hand part. My Ravelry store is closed. Special thanks to Marit (Mitt) and Sonata (Craftzone) for feedback. This pattern is based on Ohara Koson drawing. 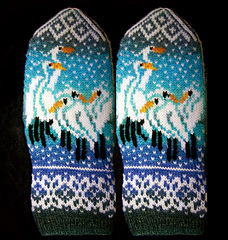 The birds’ legs, beaks, and eyes are embroidered with duplicate stitch afterwards. Only two colors are used when knitting; you’ll need about 50 g. (200 m.) of each color.